Using a dado is a very functional and strong method for connecting two pieces of stock. Once you learn how to cut a dado, you'll find these woodworking joints especially useful when building cabinets or bookshelves. A dado is a groove cut into one piece of wood into which another piece of wood will fit snugly. For instance, when building a bookshelf using 3/4-inch-thick stock, you would cut a 3/4-inch-wide dado into the shelf upright and then glue the shelf into the groove. There are a couple different methods for cutting a dado on a table saw. Probably the most common method is to use a stacked dado head cutter on a table saw. This consists of two 8-inch-diameter, 1/8-inch-kerf saw blades with a number of 1/8- and 1/16-inch chippers in between. By adding or removing chippers, you can get pretty much any width of dado between 1/4 and 3/4 inch. Wider dadoes can be cut by making more than one pass through the saw. A stacked dado head cutter set should only be used on a table saw or on some radial arm saws (check the tool's documentation to see if your table saw or radial arm saw will accommodate a stacked dado head cutting set). Do not attempt to use a stacked dado head cutting set on a circular saw, as this is extremely dangerous. Another option is a "wobble" dado set. This is a single saw blade set on an adjustable spindle. Adjusting the blade angle on the spindle will change the width of the dado. While these are much cheaper than a stacked dado head cutter set, the results are far less predictable and often disappointing. Also, the safety of wobble blades is questionable. It's better to save your money for a quality stacked dado set, or use a different tool for the job. Another popular method for cutting dadoes is to use a straight-cutting bit on a router. When using a router to cut a dado, keep the bit speed low and cut the dado in multiple shallow passes, going about 1/16 to 1/8 inch deeper with each pass. This helps to prevent burning the bit or the wood and prematurely dulling the bit. Use a straightedge to guide the router and ensure a straight path. Be advised that using a 3/4-inch router bit will cut a dado slightly larger than a 3/4-inch sheet of plywood (which is really 23/32 inch thick). While 23/32-inch bits are commercially available, using a 1/2-inch bit and two passes can provide the same result. 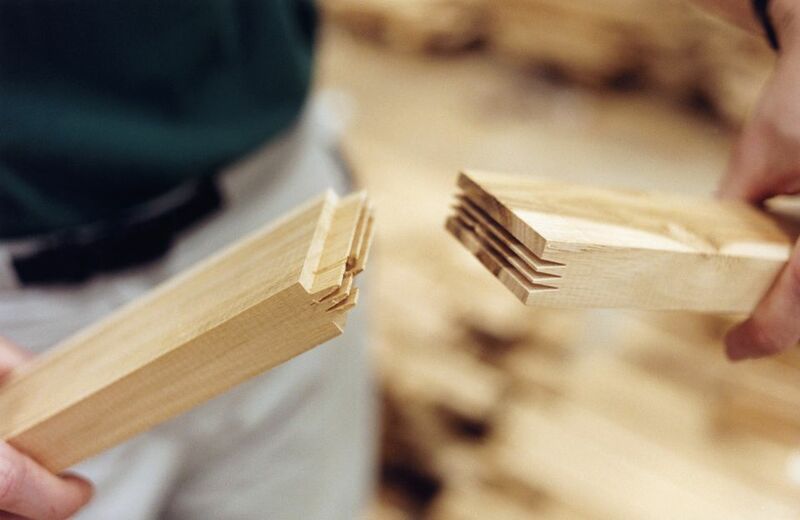 When cutting a dado, try to avoid cutting any deeper than one-third of the way through the stock receiving the dado, to keep from weakening the stock. For instance, when cutting a dado in a 3/4-inch-thick material, make your dado cut about 1/4 inch deep. There may be times when a dado shouldn't be cut the entire length or width of the stock. In this case, it's usually best to cut the dado on a router table: Set the fence to the proper width and mark the start and stop points for cutting the dado on the fence with a pencil. Then, after starting the router, slide the stock over the top of the head (keeping it against the fence) and ease it down onto the cutter. Slide the stock forward to the stop point, then back up the stock an inch or so before turning off the router. Wait for the cutting head to stop spinning before lifting the stock off of the table.